A forgettable product. It isn't bad, exactly, but also doesn't do anything particularly well. A poor selection of games and a fussy joystick make it a skip. Memory's a weird thing, isn't it? Your brain records every moment in your life and locks it away forever. And then suddenly, a sound, a smell, a piece of beige plastic can send you tumbling back to a different time. Sitting on the floor of my office, unboxing the C64 Mini, I wasn't 33 anymore but eight, sitting at the blue formica table in the corner of my bedroom. In front of me was a hand-me-down Commodore from my neighbor, an engineer who taught himself BASIC in his semi-retirement. He chain-smoked cigars and was never without a tin of stout in his hand, smells that permeated the skin of this computer, never to be washed away. 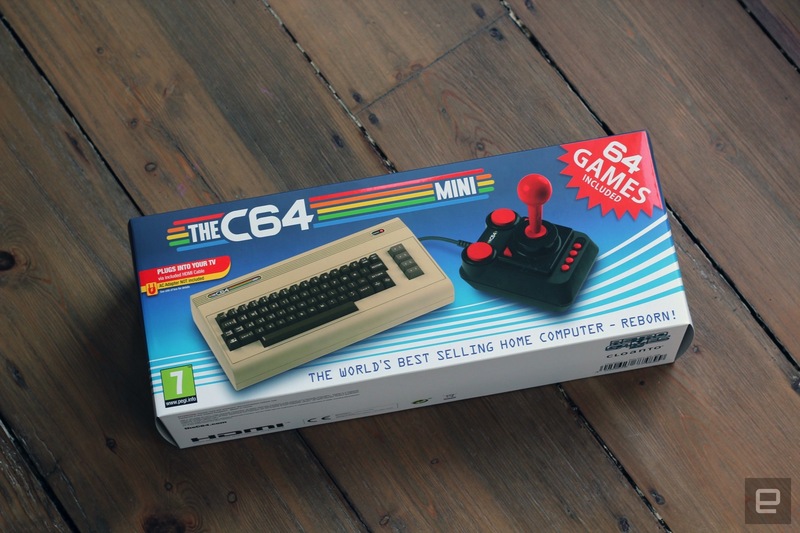 It's these pangs of nostalgia that British company Retro Games Ltd. is looking to take advantage of to sell a "mini" version of the Commodore 64. For the uninitiated, the microcomputer was the computer of the '80s and the first machine that many folks ever got their hands on. Even in Great Britain, which had been the crucible of the Sinclair vs. Acorn battle, Commodore holds a special place in millions of hearts. My own Commodore 64 was hooked up to a 10-inch, black-and-white portable TV with a bent aerial. White-out was painted on to mark the tuning locations for BBC 1, BBC 2 and ITV, and I vividly remember playing (Pac-Man knock-off) Radar Rat Race purely because I had the cartridge, which loaded faster than games on cassette. I used that battered, beige machine for so long on that TV that, when I finished unboxing and turned the C64 Mini on, I was actually surprised to see it output video in color. The C64 Mini is a valiant attempt to join the current craze for tiny retro consoles that hark back to our childhoods. Unfortunately, a bad controller, questionable software design and the poor roster of games on offer sour the package here. While it’s clearly been put together with a measure of love, this is one nostalgia trip you can do without taking. Be the first to review the THEC64 Mini? The C64 Mini is a shrunken-down version of the original, although its keyboard and casing is just for show. Basically, it's a hunk of plastic that's been cut and painted to look like the real deal, even if the icons on the underside of the keys are missing. If you aren't planning on using it as a working machine, it could easily pull double duty as a paperweight. Beneath that exterior, I suspect, is a dinky miniboard, like a Raspberry Pi, that's running an emulator. That would explain the closeness of the two USB ports that run where the C64's serial ports originally sat and the micro-USB (power) and HDMI-out ports. The original model had the power and video-out connectors far further away, so clearly there's a reason for the change. Also inside the box is a micro-USB-to-USB cable and a HDMI lead, and I'm sure some will be upset that there's no power adapter. That said, most HDTVs have a powered USB port, and you probably have an old smartphone adapter laying around somewhere. A nice touch is that the manual's cover is styled to mirror that of the original CPC 64 documentation. 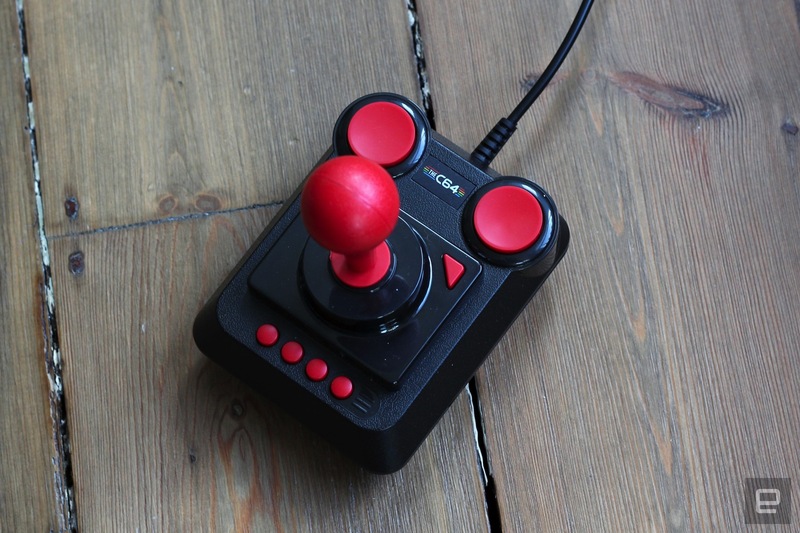 Rounding out the bundle is a remake of the Commodore 64 joystick, with extra buttons and a USB connection. It is, unfortunately, stiff and often unreliable, with gameplay suffering because of it. I needed to ram the palm of my hand into the stick, hard, if I wanted even a hope of my character going in the right direction. I won't share my notes here, but there were more than a few expletives included. It may loosen over time, for sure, but I doubt the accuracy will improve much. The C64 Mini's OS is designed like a carousel, and it takes less than a second to boot up from cold. Essentially, the lower half of the screen is the box art for each game that you can move left and right between. Above it, the left side holds a still and/or footage from the game while the right offers a brief synopsis of the game. There are 64 titles on the system, although you may be surprised and disappointed to learn that plenty of notable games are absent. I suspect licensing issues precluded the inclusion of titles from major publishers like (then) Lucasfilm Games, Origin and EA. If you were hoping to play Zak McKracken, Maniac Mansion, Pirates!, Ultima, Wasteland, Skate or Die or Elite, you're out of luck. I want to be honest and say that your mileage may vary and that the titles preloaded onto the C64 Mini could be cornerstones of your childhood. In the days before the internet and monolithic games publishers, it was much easier to miss titles that didn't pop up in your local store. But even so, it feels like the game selection here is the leftovers from a dumpster dive rather than a curated experience of the "best" titles the platform had to offer. The biggest names in the roster include Impossible Mission and its sequel, Speedball, and, uh, its sequel, and Paradroid. Sports fans may also get a tickle out of Summer Games II, Winter Games and World Games, which I dimly recall being forced to sit through as a kid. Memory plays tricks on us all, however: I thought I had fond memories of Who Dares Wins II, another included title here. After playing it and doing some research, it turns out that I'd actually played Commando, of which Who Dares Wins was a fairly shameless copy. Retro Games clearly knows that this is an issue and makes a big deal about the fact that you can sideload other titles onto the system. The usual copyright caveats apply, but the only thing between the Mini and downloading a bunch of .D64 ROMs onto a flash drive is your conscience. Although it's worth noting that you can only load one title at a time, and you have to do it in BASIC. Actually, it's harder than that, because my generic Windows USB keyboard wouldn't navigate the C64 Mini's carousel menu. You need to use the joystick to activate BASIC and then switch to the keyboard to type the commands necessary to load the game. Except the C64 Mini only has two USB ports ... So you pull out the joystick to make room for the flash drive, right? As soon as I pulled out the joystick, the console reset itself back to the carousel, so the only way to do it was to type with the virtual keyboard. The solution to this is to use a keyboard with integral USB ports or a standalone USB hub, but at this point I wondered if it was worth the effort. Retro Games has promised that an update will make this process easier in the future, but when that will happen is anyone's guess. The games don't ship with documentation, and the short blurb explaining the game's basic premise is all the information you get. As a consequence, the learning curve for most games is steep, and not one that you're likely to want to persist with. Relearning the gameplay and controls for Impossible Mission is made all the harder because most games just aren't built right. There's a video of Shigeru Miyamoto explaining the level design of the first Super Mario Bros. world floating around the internet. In it, he explains how those first few minutes are a gentle introduction into the gameplay mechanics without the need of a long, dull manual. In the pre-NES era, games shipped with lengthy, often needlessly complex manuals. And it's hard to readjust to titles where you're just dropped into the action. Of the 64 games in the roster, there are a lot of titles that offer similar gameplay in a different package. There are side-scrolling space shooters like Uridium, Armalyte, Cybernoid, Cybernoid 2, IO, Mega Apocalypse, Netherworld and Hunter's Moon. There are puzzle platformers like Creatures, Cyberdine Warrior, Everyone's a Wally, Firelord, Gribbly's Day Out, Hawkeye, Heartland, Hysteria, Jumpman, Mission AD, Nobby the Aardvark, Nodes of Yesod, Robin of the Wood, Rubicon and ... you get the idea. The point is that you shouldn't walk in and expect to be able to enjoy a wide variety of different games. Retro Games' more-is-more philosophy ensures that rather than easing in to a curated and specific experience, you're getting everything thrown at you. It's a shame, because some of the titles above are better than others, and, perhaps, 30 decent games would have been preferable to 64. I should add that in a couple of situations, the system actually managed to crash. That's probably a result of the fact that the original code is running on an emulator, with all the original bugs still present. Again, it'll depend on your age and attitude if you think the company should have fixed this for easier use or that it should have left it well alone for a more authentic experience. One thing that the C64 does get right is save states, a feature clearly cribbed from other retro "mini" consoles. Much like its rivals, the C64 lets you save states up to four times for each title you play and then hit the pop-up menu to reload it. You'll take advantage of that feature quite often, thanks to how inaccessible and difficult some of these games really are. Here's the rub: This thing exists not because there's a lot of demand for it but because Nintendo started a trend. Nostalgia is a great filter, because your brain dumps the bad stuff and leaves you with warm, fuzzy, incorrect records of what happened. Whatever really took place has been pushed through your brain's equivalent of an Instagram filter called Romance Pro. Retro consoles have to be built with that in mind and can't simply replicate the experience of the '70s and early '80s. If things are as bad as they actually were, your brain clatters up against the truth, and that hurts. Companies entering this space need to remember to smooth out some of the rougher edges. The hardware needs to look a little shinier, work a little better, feel a little nicer than it did a generation ago. This is exactly what Nintendo nailed with its NES and SNES revivals, but it hasn't happened here, and the curation these projects need simply isn't there. If you're already a member of the retro gaming community, you don't need to spend the money, or time, on this product. And if you were looking to dip a toe into this world, there are other, better ways to do it. This wasn't the first retro Commodore 64 console, and I doubt it will be the last, but this one was probably the best attempt we're likely to see. And sadly, it falls a little bit short, especially when you're spending this amount of money on it. People often say that you could buy a Raspberry Pi emulator box for a lot less cash, but that's somewhat missing the point. Nintendo made an effort to build a machine that tickled our nostalgia tentacles while also being easy to use. The C64 Mini does not meet that standard, and so it's actually probably preferable to invest in a RetroPie kit, even if it is ethically dubious. There isn't enough here for nostalgic types, nor a decently packaged experience sufficient for casual types who want to play something different.